For some time now, I've known that Barry Ritholtz's new book Bailout Nation was definitely not going to be kind to former Federal Reserve Chairman Alan Greenspan, but, had I known that it would offer the most damning critique of his term at the central bank, I certainly wouldn't have let the book sit on my desk for the last few weeks before finally picking it up the other day and polishing it off in record time. With the subtitle How Greed and Easy Money Corrupted Wall Street and Shook the World Economy, it was natural to think the focus might be more on greed than easy money, but that's really not the case. Greed is a constant on Wall Street and, for that matter, in most of the rest of the world, but financial systems don't implode unless generously lubricated with easy money, bailouts, and moral hazard - key elements of the Greenspan legacy. Ironically, Fed economists and assorted hangers-on are meeting in Jackson Hole this week to deliberate on what's changed in the world of finance and monetary policy over the last year. It was four years ago at that same gathering (i.e., before the housing and credit bubbles met their respective pins) that some were still lauding the former Fed chief as "the greatest central banker of all time" in something of a "going-away" party. Anyway, the book is not only fun-filled, thanks to the inimitable writing style of Mr. Ritholtz, but it's chock full of interesting little bits of information and perspective that, even to me, cast new light on what will surely be looked back upon as a disastrous period for central banking. For example, it is common knowledge that Alan Greenspan was much more interested in asset prices than were his predecessors - they didn't coin the term "the Greenspan put" for nothing - but this passage gives the concept a bit more color. 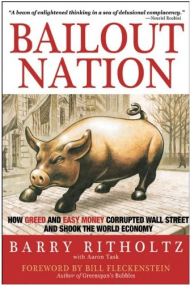 History teaches us that the development of Bailout Nation, Wall Street edition, was not done in secret meetings. Rather, it occurred in the very public functions of the Federal Reserve, and the subsequent results of its policy actions. The Greenspan Fed created an endemic culture of excessive risk taking. The U.S. central bank created moral hazard not by targeting inflation or the business cycle, but instead by focusing on asset prices. From the squishy focus on psychology, it was a short hop to asset prices. After all, when price go down, it negatively impacts sentiment, right? This was the Fed's fatal flaw under Greenspan's leadership. The Fed's previous rate cuts had only implied a concern over asset prices; now, the chief explicitly affirmed the fact. The Fed was not concerned just about inflation and employment; asset prices were an "integral part" of its calculus, too. This was revolutionary. Fed chiefs didn't usually care so much about stock prices; they were more concerned with the bond market. After all, it was the fixed-income traders - known as bond ghouls for their morbid affection for bad economic news - who set interest rates. Worries about deficits, inflation, and trade balances all found a receptive audience among the bond traders. Once Wall Street figured out Greenspan was concerned about equity prices, it wasn't too long before it learned how to play the Fed like the devil's fiddle. When rate cuts did not materialize, the Street would have itself a hissy fit. It is always ill advised to anthropomorphize markets, but observing the market kick and scream when cuts weren't forthcoming was akin to watching a two-year-old throw a tantrum. It may be illegal to manipulate the markets, but no trader will ever got thrown in jail for manipulating Greenspan. Unfortunately, the current Fed chairman seems to share this same trait. Barry's book is indeed a great read that sheds a lot of light on how the heck we got here. Unfortunately, it also shows that most of what the fed is doing today probably won't fix the problems we have. At best current policy will kick the can down the road.